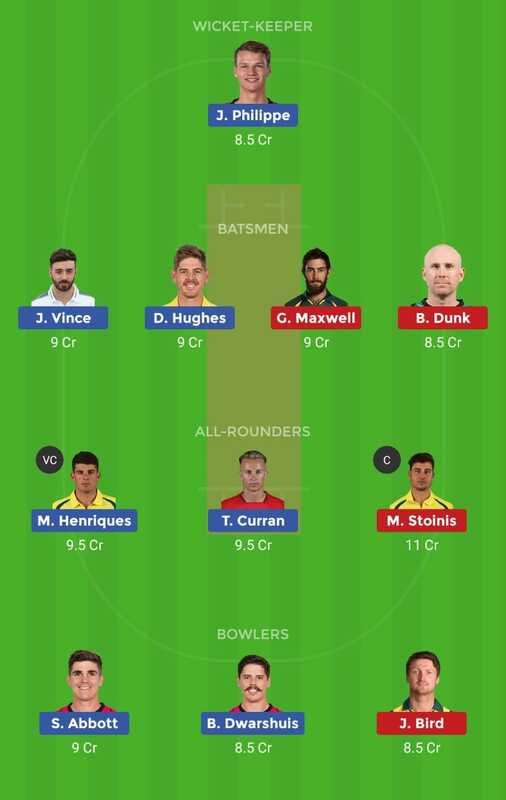 SDS vs MLS, 56th Match, Big Bash League 2018-19.
from Sydney Sixer side Nathan Lyon replaces Ben Manenti in the squad. Spin sensation Nathan Lyon will come straight into the playing XI replacing Lloyd Pope or Jack Edwards. Sean Abbott, Lloyd Pope, Tom Curran, James Vince, Mickey Edwards, Ben Dwarshuis, Jack Edwards, Moises Henriques (c), Dan Hughes, Steve O’Keefe, Josh Philippe, Jordan Silk, Nathan Lyon. Josh Philippe (wk), Dan Hughes, James Vince, Moises Henriques (c), Jordan Silk, Jack Edwards/Lloyd Pope, Tom Curran, Sean Abbott, Steve O’Keefe, Ben Dwarshuis, Nathan Lyon.